"CAN WE LIVE WITH CHINA? U.S.-CHINESE RELATIONS IN TUMULTUOUS TIMES"
​The Krasno Events Series is a series of regular lectures, talks and discussions at UNC-Chapel Hill to enhance our understanding and comprehension of global affairs, past and present. In particular in tumultuous and transitional times which have led to much unpredictability and instability, it is essential to obtain a better grasp of the driving forces, the fears and ideas as well as the personalities that shape our age. The Krasno Global Affais & Business Council and the Krasno Events Series seek to contribute to achieving this and provide students and the general public with deeper insights into 20th and 21st century global political, social, security and economic affairs. 1. "America in World Affairs: the Cold War and Beyond"
2. "Ambassadors Forum & Distinguished Statespersons Forum"
Students, faculty, administrators and, of course, members of the general public are more than welcome to attend and participate in our events. The events are free of charge & no ticket is required. 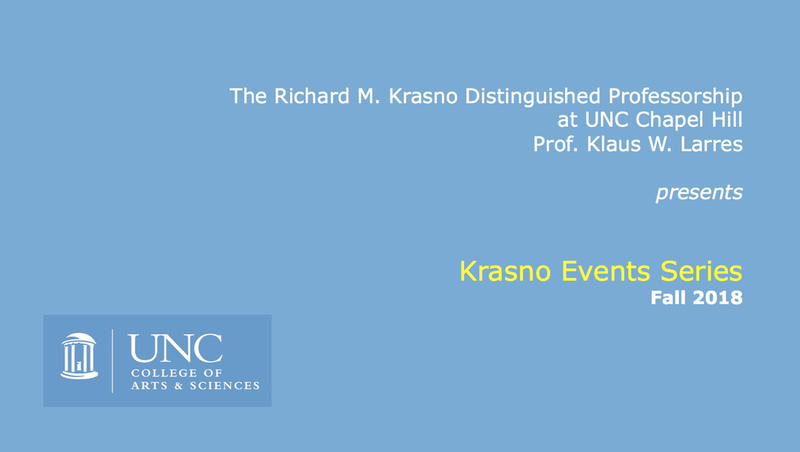 The Krasno Events Series & the Krasno Global Affairs and Business Council are run by the Richard M Krasno Distinguished Professorship in History and International Affairs at the University of North Carolina at Chapel Hill, USA. Maya Kapoor, Senior Program Assistant. Mary Newby, Program Assistant, Wilson Library liaison. Will Yoder, Videographer, video editor.